The Youth Homelessness Demonstration Program (YHDP) is an exciting new initiative designed to reduce the number of youth experiencing homelessness. On March 14, 2019, HUD released the FY 2018 YHDP NOFA. $75 million in funding will be awarded through this NOFA to up to 25 communities (8 of which will be rural). HUD strongly encourages all communities to consider applying. Applications will be submitted through grants.gov (and not through e-snaps). The deadline for submissions is May 15, 2019 at 11:59:59 PM EDT. Everything your community needs to develop, implement, evaluate, and continuously improve a coordinated community response to prevent and end youth homelessness. This page includes the Ending Youth Homelessness Guidebook Series and the YHDP Listening Sessions. 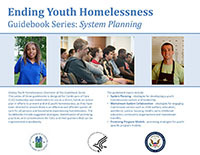 As selected YHDP Communities are creating and implementing their Coordinated Community Plans, there are many lessons learned and resources developed that are helpful to all communities as they work on preventing and ending homelessness among youth.